Some of our favourite pop culture stories are set within fantastic fictional worlds that feel, look and sound real. 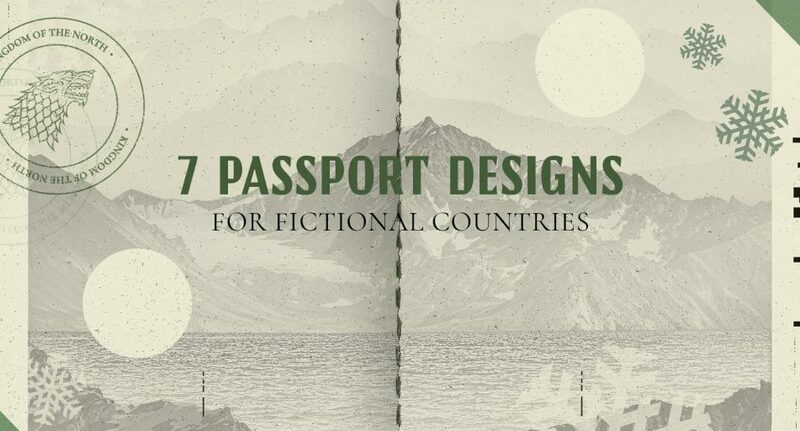 So real in fact, that we can easily imagine these fictional countries issuing passports to their citizens. But what would they look like? We chose some of our favourite characters and issued them with their very own passports… because everyone deserves a holiday! This sprawling country is home to the principled, loyal Northmen and the birthplace of Arya Stark. It seems like trouble finds her wherever she goes, but no one is more prepared to fight for her survival than she is. Resourceful, quick on her feet and not one to do what society expects of her, Arya has certainly done her fair share of travelling. Keep your eye on her passport pic though; it might change before your eyes. NOTE: The dating system is based on Aegon the Conqueror’s first landing on Westeros, and all dates are either AL for Aegon’s Landing or BAL for Before Aegon’s Landing. Tatooine is not a place for the faint of heart–or the easily sunburned. Its two suns make it nearly impossible to live here, but there are a few brave inhabitants. One Tatooine farm-boy that has gone on to big things is Luke Skywalker. After receiving his passport, he went onto become one of the greatest Jedi the galaxy has ever known and travelled to many planets far far away. What’s he up to now? You won’t have to wait long to find out. NOTE: BBY stands for Before the Battle of Yavin; ABY denotes After the Battle of Yavin. Go through the wardrobe and you’ll find The Kingdom of Narnia, home to humans, talking animals and any number of other mythical creatures. It’s a land of rolling hills, mountains and forests, all guarded by the watchful eye of Aslan, the creator and one true king of Narnia. Aslan represents all that is good in the world and Narnia’s inhabitants have absolute faith in him. Looking at his big furry face, we can’t help but trust him, too. Never in one spot for long, Aslan is always on the move. The Shire is a beautiful, fertile land with many coSy villages and forests. It’s home to the Hobbits, who developed an extensive agricultural system that yields cereals, fruit, wood and pipe-tobacco. Our favourite hobbit is obviously Bilbo Baggins. Who else? He’s clever, compassionate, brave and humble. Bilbo has done his fair share of exploring far away lands, even though he misses his home comforts like delicious cakes and scones. NOTE: TA stands for The Third Age. The Japanese Pacific States are a puppet state of the Japanese Empire and home to Juliana Crain. It’s not an easy place to live, but Juliana optimistically believes she can change things. Her caring and sometimes naive nature gets her into plenty of trouble, which is, of course, why we love her so much. Maybe now that she has this passport, Juliana can pack her bags and explore what other countries have to offer. Krypton is home to a great civilization of advanced super-people and some of the most beautiful landscapes you could hope to see. Although their superhuman powers only work on other planets, Kryptonians are extremely intelligent and have advanced technology. The Kryptonian we think most likely to save the world? Kal-El, of course. Now that he’s got his passport, we think this boy will be a frequent flyer. Panem is an autocratic, post-apocalyptic nation segmented into thirteen districts. District 12, a poor and sparsely populated coal-mining district, is home to Katniss Everdeen and her family. Katniss is strong, independent and looks after those close to her. She can be a little awkward and sarcastic at times, but we love her anyway. We hope she uses this passport to explore the world beyond Panem. These fictional countries (brought to you by Budget Direct Travel Insurance) were dreamt up to stage some of the most dramatic stories of our time. They are also home to some of our favourite characters, who, with these passports, are now free to travel and see the world, just like us. DISCLAIMER: This article and the images contained are not endorsed, authorised or sponsored by the copyright/trademark owners of any of the images used. 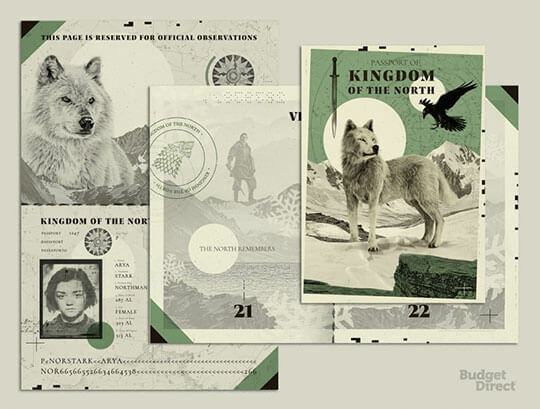 The visuals used in the creation of the passports are stock photography and stock images. In cases where stock imagery wasn’t available, we worked with images labelled for reuse.